At Body Harmonics we care about your success and the success of your clients. That’s why when you graduate from a Comprehensive Pilates Track or Specialist program, we continue to support and encourage you with ongoing learning opportunities, special discounts and marketing tools. Join our growing team of talented and committed teachers and teacher trainers. Body Harmonics Pilates trained teachers based in Canada receive 10% discount on professional liability insurance with Sports & Fitness Insurance Canada. Submit your completed application form with a copy of your current diploma. Once your information is approved, the company will charge the premium specified on the form minus 10%. Download your form here. Our US-based Pilates trained teachers receive 25% discount on all-inclusive insurance with Pilates Insurance Plus. In addition, the company offers the special student rate of $25 for those currently completing the program requirements. You can also find insurance options through the Pilates Method Alliance (PMA) and other industry associations. 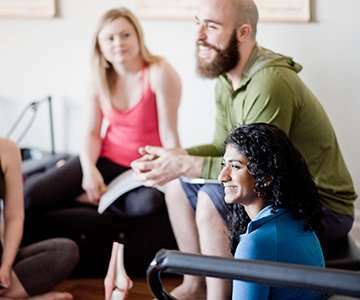 Enjoy a preferred teacher rate on classes held at our Toronto Pilates & Movement Studios. Please inquire. Save 15% on all items at our Body Harmonics Retail Boutique during your program or workshop. This offer excludes Teacher Training materials and Online Shop items. Save 50% and get CECs when you audit a Body Harmonics Teacher Training program (minimum one full module) or workshop (full length) that you have taken previously. Contact our Teacher Training team to book. Advanced notification on upcoming Teachers Only Master Classes, workshops, events and more. Subscribe to our Teacher Training Newsletter to stay informed. Use of selected Body Harmonics trademarks, logos and photography. Please inquire. * Note: To maintain good standing, graduates of our diploma programs must fulfill CEC requirements.